The new Rotherham United boss has been linked with a move for his former striker. Alan Stubbs has reiterated he won't be making a move for Jason Cummings as the new manager of Rotherham United. Stubbs swapped Easter Road for the Millers last month, but insisted that he won't be raiding his former club, claiming it wouldn't be "morally right." The former Celtic and Everton defender is standing form on his stance, underlining that Cummings won't be at Rotherham next season. He said: "I've said all along that I wouldn't go back to Hibs for players and I'm not about to change my mind on that. "I know we've been linked to Jason over the last few days but it's certainly not coming from us." 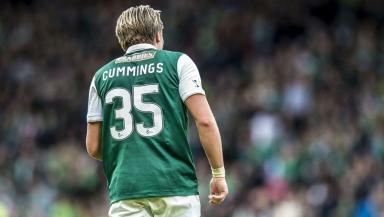 Cummings, who scored 25 goals for Hibs last season, is considered essential to his side's chances, with new boss Neil Lennon keen to sign the striker to a new contract. "I'm hoping to get the Cummings negotiations finished off quickly," he said. "If we can, that will be another boost to the squad. "We're under no pressure to sell him so I'm not worried about any rumours at all. "I think he's happy here and he knows he's wanted. I'm still getting to know him but he has an infectious personality."